In Story Mode, you first choose your rival's level, then select an opponent out of the rivals that are of the selected level. You can freely change the levels and rivals within the time limit. You win if you cross the finish line before your rivals (characters from the original comic book), and you lose if your rivals cross it before you. The game ends if the remaining time reaches zero. You have to race one-on-one or in a group of three or more depending on the story. This is based on the story written in Wangan Midnight comics, volumes 20 to 24. Join a race with "Kijima," who will show you his obsession with the FC3S type RX-7, a "classic" car. Local Arcade Versus Battle Mode, is where players verse each other in location, while Online Ghost Battle Versus Mode is where players can verse their friends w\even when they're not playing! Players will verse a ghost version of the player, as the game tracks and creates a replication of players driving styles! If the ghost version of the player is beaten, that player can then challenge the player who beat them to get even. NB: You cannot play the Online Ghost Versus Battle Mode if you are not using a BANAPASSPORT Card. Time Attack mode is excactly what it sounds like, players race against the clock, trying to finish tracks with the best time. Meanwhile, The Extreme VS Mode changes up the already available VS Mode by reversing the start and goal points of familiar courses to give a fresh VS experience on well-known courses. Everything is backwards, curves and concourses, even junctions and obstacles, meaning a trap could be in unexpected places and the way to drive the course has entirely changed. A challenging technical course with high speed turns one after another that could only appear in a mountainous area. This is a high speed area in which you can race through central Yokohama and the port district and view many famous sightseeing spots. 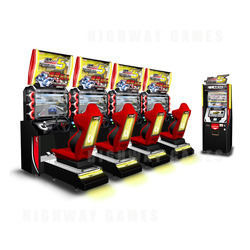 In Wangan Midnight Maximum Tune 5, players can also get a "Level" corresponding to their progress and a "Title" corresponding to their gaming style. The first level is "N Class" and your level rises, one step at a time, when you satisfy certain conditions during the game. Your level will be displayed during the game and your level does not fall, even if you lose. N Class -> C9 Class -> C8 Class -> ...... -> C1 Class -> B9 Class -> B8 Class -> ...... -> B1 Class -> A9 Class -> ...... etc. The conditions you need to fulfill to increase your level in the first stages are as follows. There are also other conditions for increasing your level. Your level goes up by 1 every time you complete 10 episodes. There are other conditions to further increase your level. Wangan Midnight Maximum Tune 5 includes 9 new cars, including the Toyota GT 86, Subaru BRZ, Nissan Skyline RS-X, RUF Rt35, BMW M3 and Mercedes-Benz SLK. This game is jam-packed full of features including BANAPassport cards, internet rankings, customization options, and much much more!